This section isn't intended to replace the dozens of holiday sites on the web. It is merely a personal recommendation for places that we've stayed in with our three dogs - two dobermanns and a golden retriever. 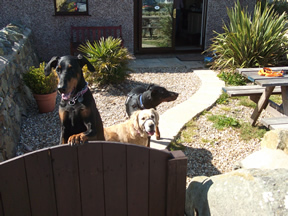 Quite often we've made a last minute booking to stay somewhere with three large dogs! As well as a cottage big enough for all five of us and an enclosed garden, we generally like somewhere with off street parking, a bath as well as a shower, an open fire/woodburning stove and a washing machine with drying facilities. Since starting this page we are, sadly, down to two dogs. We stayed here for a weekend in 2011. Our first holiday in years with only two dogs, but the property was plenty big enough for more dogs - and the only limit imposed is the number that you can reasonably take care of. 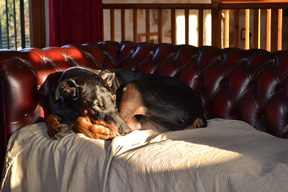 We loved this place as there were no rules - dogs could curl up on the sofa and were allowed in the bedrooms. We had a private enclosed patio area and just beyond that a massive shared exercise area. 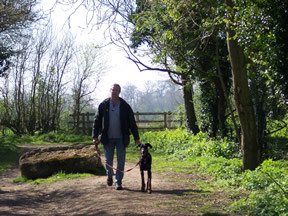 Kennels enable you go to enjoy The Eden Project or other human-only attractions. 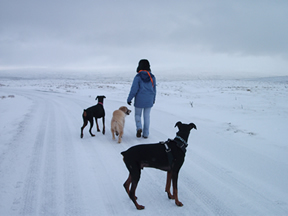 The owners had built the accommodation for the comfort of dogs and their owners and we enjoyed it so much we came back for Christmas. Visit www.bedandbasket.co.uk for further information. We stayed here again for Christmas and New Year 2013/14. We took many similar pictures of our lovely Beau, right, but the updated news is that we were able to take the dogs to the Eden Project this time! They can't go in the biomes, but if there's two or more of you then you can take it in turns to pop in. We stayed again in December 2015, this time with our flatcoat Ziggy and golden retriever Ellie. We enjoyed our fourth visit. This is one of the hotels we stayed in in Suffolk. It was fabulous so we decided to book it again for a couple of nights (to cheer ourselves up after Beau sadly left us). When we booked it, however, we were told that last time we were here they couldn't let the room the next day because it smelt of dog, and asked if we could bathe Ellie before we brought her back. Now the odd thing is that both Beau and Ellie had had hydrotherapy the day before the trip, so they'd both been showered after their swim in chlorinated water. We didn't feel that we could do much more so had to cancel the booking. Another great Suffolk hotel! In February 2015 we arranged to get together with Kev & Terri, our Norfolk distributors. We chose this hotel as it had a private dining room so that Beau could have plenty of space and be undisturbed by other dogs (would seat 8, but just perfect for four of us plus Beau & Ellie). ALL the staff at the hotel were dog friendly - and most of the other guests too. One even knew Beau from our bloat awareness campaign! The food was delicious (worth visiting for the afternoon tea alone) and the bar area, where we dined with the dogs on the first night, was spacious and welcoming. There was a box of dog items in the room - blanket, poo bags, torch, treats & a dog bowl. The grounds were fabulous and you can enjoy a walk along Oulton Broad direct from the hotel. The room was spacious - almost a suite, with plenty of space for us all. http://www.ivyhousecountryhotel.co.uk/en/ for further info. About 20 minutes away from Kev & Terri's Loddon shop. Picture is Beau in the private dining room. It rather looks as though his Equafleece is plugged into the mains, but no, he's not wearing electric PJs! We had a fabulous week here in the Scottish Highlands. All golden retriever lovers will find this place particularly magical, as it's where the first golden retriever was bred. But anyone with or without dogs would enjoy this lovely old keeper's lodge in a well kept big enclosed garden with fantastic views. The bed was the most comfortable we've ever slept in on any holiday and the lodge sleeps 6-8 people plus dogs. A week wasn't really long enough! 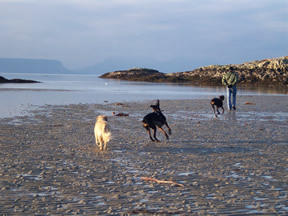 The picture shows our three dogs having fun on a deserted beach. Not a holiday as such, but we when we bought a car from Llanfairpwllgwyngyllgogerychwyrndrobwllllantysiliogogogoch we decided to stay overnight. I phoned to enquire about B&B at Blackthorn Farm and was delighted to hear that they had a one bedroom cottage which the owners let out by the night, big enough for all five of us. You can see the enclosed garden - which is where we sat eating our breakfast which the owners cooked for us. We didn't have much time for sightseeing but had a couple of walks on the fabulous secluded beaches. Sadly this was to be Roxy's last trip away with us before she succumbed to DCM just three weeks later. www.blackthornfarm.co.uk - featured on Channel 4's Four in a Bed in October 2014. We also enjoyed our week at this fantastic location near Fort William. 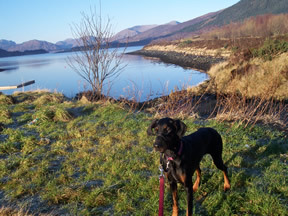 Pictured right is Roxy on a beautiful walk just five minutes' walk from the cottage. There's a great fish restaurant on the loch side where you can park right outside to keep an eye on your dogs whilst you're eating. Ben Nevis is a short drive away - fantastic scenery, but we can only comment on the view from the ground as we didn't venture up the mountain! The cottage we stayed in is no longer available for holidays but I'm sure there are other places from which to stroll out and enjoy the stunning views! Friends were rather surprised to hear that we were off to Durham for a week in January! The lure was a week in a cottage with access to an onsite agility arena - 120ft x 40ft with lots of equipment to keep our dogs (and I!) agile. Ellie and I go to fun agility every week, but after a week's stay at this great venue (including an hour's tuition with the owner) we improved our skills no end. The picture shows us on a visit to Cow Green Reservoir possibly the quietest place I've ever visited. Needless to say not much swimming was done on this cold snowy day! The Cotswolds provided the setting for this lovely weekend away. We stayed in an annexe to the owners' home, which was plenty big enough for the dogs with a fully enclosed garden. We just needed to walk across the road and down a small path to get to a fabulous circular walk (pictured right). The lake is fenced off so we didn't need to worry about taking wet muddy dogs back indoors with us! Plenty of picturesque villages around, but our favourite is Bourton on the Water, where we'd visited some years ago with one of our dobermanns and our lovely late flatcoated retriever who amused the tourists by having a thoroughly enjoyable paddle, as flatcoats are inclined to do! Originally we'd booked a dogsitter to stay at home whilst we stayed in Yorkshire to celebrate a friend's birthday in May 2013. 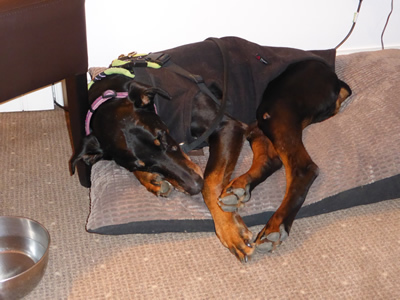 But a week before the holiday Beau collapsed, so I was reluctant to leave him whilst still awaiting test results. I phoned the hotel and they were more than happy to give us one of their dog friendly rooms. 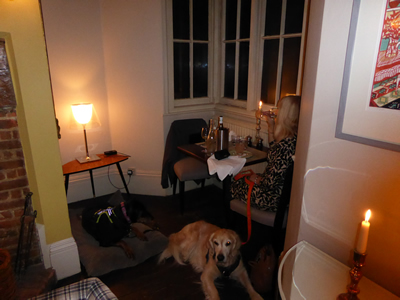 We were able to have the dogs with us in the bar for meals, and whilst we couldn't take them in the restaurant with us we were able to take them into the private dining room where we celebrated our friend's birthday. First time that Beau and Ellie travelled on a steam train this weekend! We had a weekend away in Suffolk in May 2011. Lovely walks at Sizewell, Aldeburgh and various places off the beaten track. But we can't recommend the holiday accommodation!